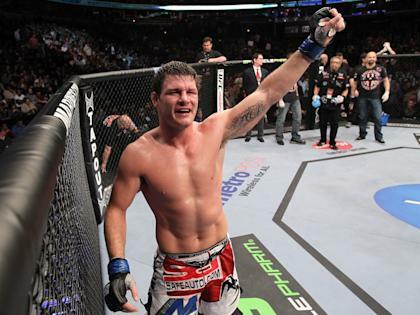 Michael Bisping has fought 17 times in the UFC over a 6 ½-year span and only once was he not competitive. With a just small amount of luck, Bisping could be heading into his bout Saturday in Sao Paulo, Brazil, against Vitor Belfort with a 16-1 record. A win on Saturday over the veteran Belfort will not only improve Bisping's UFC record to 14-4, but also it will finally vault him to a title shot. One of the great MMA mysteries of the modern era is how Bisping was able to keep winning so regularly without getting a title shot. But UFC president Dana White has promised Bisping that if he beats Belfort on Saturday, he'll challenge Anderson Silva for the middleweight title later this year. That's good news to Silva, who disposed of Belfort in less than 90 seconds in 2011 and who isn't interested in fighting rematches. But it's great news for Bisping, who seemed to be in the wrong place at the wrong time in terms of getting a title shot. 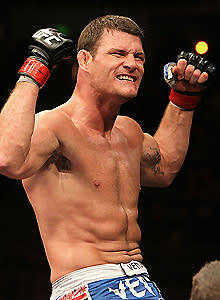 "Some other guys have had an easier path to the title, that's for sure," Bisping said. "Look at some of the past contenders: Patrick Cote, Thales Leites, people like that. Demian Maia. It's laughable. "But on the flip side, I've been in these No. 1-contender matches and I came up short. When I fought Chael, had I won, I would have been in there. The Dan Henderson fight, it obviously didn't go my way and when you lose a No. 1-contender fight, it takes time to build yourself back up. It's not like we're fighting every six weeks. ... But I'll be honest with you, it's frustrating being around as long as I have and not having fought for the title." Bisping is 13-4 in his 17 UFC bouts dating back to his victory over Josh Haynes at "The Ultimate Fighter 3 Finale" on June 24, 2006. His losses have been disputed decisions to Rashad Evans at UFC 78, Wanderlei Silva at UFC 110 and Sonnen at UFC on Fox 2. The only fight in which he was blown out was when Henderson nearly decapitated him at UFC 100 in 2009. Though he won a fight against Matt Hamill many think he lost, razor-thin decision losses to Evans, Silva and Sonnen significantly derailed his career, at least in terms of fighting for a title. The losses to Henderson and Sonnen hurt him the most, clearly, but what also may have held Bisping back a bit is his lack of one obviously dominant skill. When the UFC was in need of challengers to fight Silva in 2010, it turned to Maia, a brilliant jiu-jitsu specialist. While few bought Maia as a legitimate threat to Silva, his jiu-jitsu alone was enough to make him enough of a threat that the bout was sell-able. The same was true of Leites, who lost an uninspiring decision to Silva at UFC 97 but whose jiu-jitsu was good enough to make him a viable opponent. Bisping doesn't have the dominant wrestling like Sonnen, or world-class jiu-jitsu like Maia, or the pulverizing punching power of someone like Chuck Liddell. Bisping has become more known for his trash talk and taunts than for any specific skill, though he's developed into a surprisingly complete fighter. Those who questioned his wrestling prior to his fight against Sonnen had to re-evaluate it because even Sonnen wasn't able to take him down at will. Except against Henderson, Bisping was never outclassed and was in every fight he's ever taken. One more win and it will get him the title shot he's long dreamed about, but in his mind, that won't be the summit. "The whole point of this is not just to get a title shot," he said. "Who cares about that? The point of getting a title shot is to win the title. That's my only goal. I think I match up pretty well against Anderson, and I think in a lot of ways, Vitor is the perfect tune-up for me given his style. "But if somehow it doesn't work out in that fight with Anderson, it's not like I'm going to say, 'Well, OK, that's it.' I'm going to go out and do what I've always done, which is look to fight the best guys I can fight and make myself better each time and win those fights and try to get back to the title. I'm about winning the title, not just getting a title shot." • White Sox '05 World Series ring for sale ... but whose?